DRENL believes it is vital for the UK to re-educate and re-evaluate older stigmatised perceptions and attitudes to Energy from Waste, and recognise and harness the energy value in RDF (Refuse Derived Fuel). The reducing electricity generation margin - that is only set to worsen – will create a period of uncertainty. With a gap between the closing of a number of coal and nuclear power stations and the 10 years it will take to replace them, Energy from Waste has a vital role to play.. Reduction in carbon footprint through lower greenhouse gases from landfill and reduction of haulage and shipping millions of tonnes of waste abroad. The future of the UK’s energy needs is currently uncertain as we move from traditional fossil fuels through transition to renewable energy generation. Around a third of the UK’s existing coal-fired power stations are set to close over the next decade. These power stations have historically provided up to 40% of the UK’s energy generation capacity but are now coming to the end of their operational life; this is to include the potential closure of Eggborough Power Station resulting in the loss of 2,000MWe from the grid; enough to power 2 million homes. Nine of the UK's fossil fuel power stations are due to close by 2015 with a further nine out of the ten existing nuclear power stations scheduled to close by 2023. These closures would deprive the UK of about 20 million kW of capacity. Electricity demand in the UK is also expected to rise beyond current generation capacity. The winter of 2013/14 had an electricity margin of just 5%. This means that the UK not only faces an issue of replacing old plant but also increasing generation capacity to meet increasing demand; furthermore, over the next two decades the UK is likely to undertake significant electrification of transport. Building additional and clean energy generation capacity is now essential if the UK is to have sufficient generation capacity. 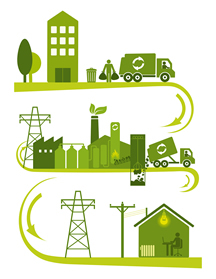 Government views energy-from-waste as a key component of meeting UK energy needs. It supports the generation of power from waste that would otherwise go into landfill. 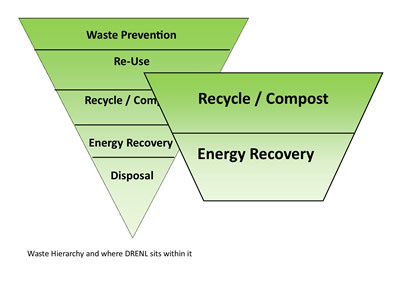 DRENL’s proposed Waste Recycling and Renewable Energy facilities can help to do this, as well as contribute to the UK’s transition to a low carbon economy. One form of this waste is ‘Refuse Derived Fuel’ (RDF). In 2013 1.6M tonnes of this waste was exported to Europe for disposal at a large cost to the UK. This is in comparison to 0 tonnes in 2008! Sending waste to landfill produces methane, a powerful greenhouse gas. The UK government wants to move towards a ‘zero waste economy’. This does not mean that no waste exists, but more a society where material left over from everyday life is reused, preferably through recycling, but where this is impractical, by providing energy. DRENL’s Waste Recycling and Renewable Energy Facilities will separate out the recyclable materials. The remainder would then be processed to create renewable energy. Our facilities will use primarily commercial, industrial, and in some case household waste. One form of the 200M tonnes of waste the UK produces annually is Refuse Derived Fuel (RDF). There are many grades of RDF, which generally can be considered as a fuel produced from waste once the recyclates and non-burnable materials have been removed. Whilst it is a fuel, the UK lacks the facilities to use it and has no space to put it into landfill. It is therefore, often exported to European countries. In 2013 the UK exported over 1.6 million tonnes of RDF to the continent - a 46% increase on the year before. The most common method of disposal in Europe is as a fuel to create both electricity and heat, which is one of the reasons countries such as France, the Netherlands, Norway, Denmark and Belgium are able to produce a surplus of energy and thereby have the capacity to sell their excess energy to other countries - , often at a cheaper rate than it takes the UK to produce it. Some of these countries either currently have or are building interconnectors to the UK. In the last 6 months of 2013 net electricity imports cost the UK £365m - as well as being the recipients of 82% of the UK’s RDF. This means we often pay to buy back the end product of what we paid to get rid of in the first place! The Associated Parliamentary Resources Group focused on this very issue in their report, ‘Exporting opportunity? Putting UK Waste to Work at Home and Abroad.’ With an increasingly low electricity margin, the UK is currently relying on foreign power imports as well as having plans to increase these. The UK currently has two lines through which we buy our power: the ‘Interconnexion France Angleterre’ and the ‘BritNed’, connecting France and the Netherlands respectively. In 2013 the UK paid the Netherlands to take 1.2M tonnes of RDF off our hands, 72% of our total exports. National Grid is also currently working on interconnector project with Belgium, Norway and Denmark so we might increase our imports further. A gain these are countries which took receipt of 160,000 tonnes of UK RDF. These arrangements are both economically unsound but also environmentally irresponsible and wasteful of the UK’s resources. DRENL sites will not only receive untreated waste, picking and sorting the recyclates, creating RDF to then use to fuel our own equipment to create power and heat for local distribution; DRENL would also take RDF from those companies currently adding to the carbon footprint by hauling their RDF to ports, often hundreds of miles away, shipping it across to the continent - for the UK to buy back the end product. The energy produced on DRENL sites, by the treatment of this RDF will be put into local power grids providing, on average for each site power for 18,000 homes.